Here’s the cookie recipe. Next up Espresso Shortbread Heart Cookies. 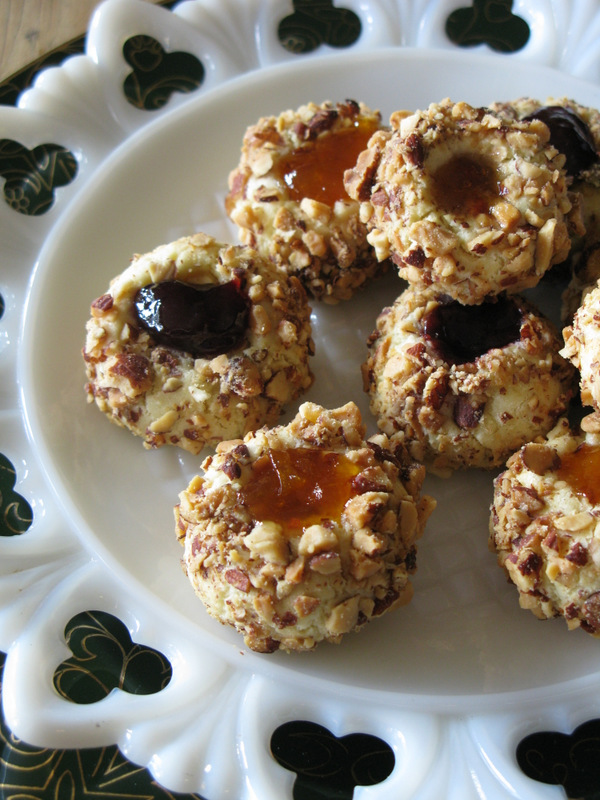 Crunchy almonds and a generous helping of Almond Paste give these thumbprint cookies added texture and flavor. First make a buttery dough with almond paste and a hint of cherry from the kirsch flavoring. Then roll the dough in coarsely ground almonds, which adds a savory toasty note to the cookie. 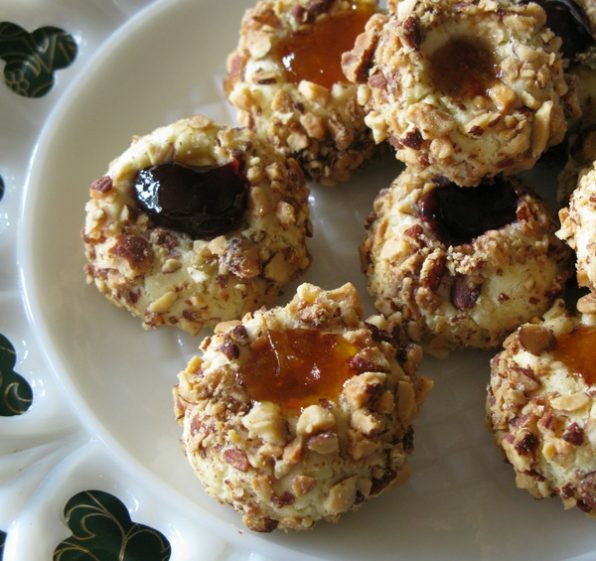 I prefer a tart jam in these cookies but any will do. One trick is to bake the cookies half way before adding the jam. This helps the jam remain moist after baking yet dry enough so that the cookies can be packed for storage or gift-giving. Preheat the oven to 325°F. Spread the almonds out in a single layer on a baking sheet. Toast them in the oven until lightly browned and fragrant, approximately 8 to 10 minutes. Cool then chop them coarsely in the bowl of a food processor fitted with the metal blade. Dump the chopped almonds onto a large plate or baking sheet. Set aside. Increase the oven temperature to 350°F. Place two racks in the oven, positioned on the top and lower thirds of the oven. Line 2 or 3 baking sheets with parchment paper. Place the almond paste and sugar in the bowl of a mixer fitted with the beater. Beat on medium speed until the mixture resembles wet sand, approximately 2 to 3 minutes. Add the butter and continue to beat until mixture is well blended and slightly lighter in color, for another 2 minutes. Blend in one egg, one yolk and the Kirsch. Stir in the flour and salt just until there is no flour visible. Set aside. Place the remaining egg white in a small bowl. Beat it with a fork until it is smooth. Using a small cookie scoop or tablespoon, divide the dough into ½-ounce pieces. Roll each piece into a small ball approximately 1 inch in diameter. Dip each ball of dough into the egg white then roll it into the toasted almonds. Place the coated dough spaced 2 inches apart on the prepared baking sheets. Using your thumb or the handle of a wooden spoon, indent the center of each ball of cookie dough. Bake the cookies for 10 minutes. Remove them from the oven. Gently press on the indent in the center of each cookie. (If you press too hard, the cookies may crack.) Use a teaspoon to fill the indents with some of the jam. Cool the cookies on wire racks. Then store them in airtight containers where they will stay fresh for a week to 10 days. Or they may be frozen for up a month. For many years, I have had a professional relationship with American Almond, one of this country’s oldest manufacturers of almond paste and nut products. This recipe and photo is one I developed for them several years back.